Notes: 1. This was the second film directed by Frederick Sullivan and with scenarios by Lloyd Lonergan, derived from the series by Clarence Herbert New, Adventures of a Diplomatic Free Lance, which had been running for the previous five years in Blue Book magazine. 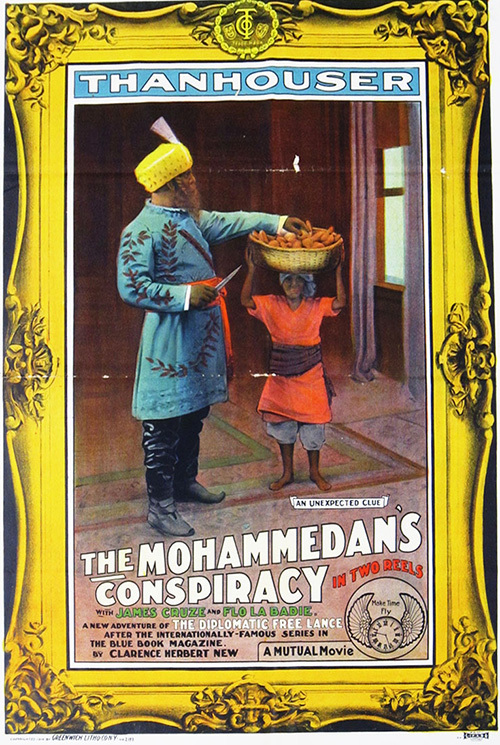 The entire Thanhouser series comprised the following: A Leak In the Foreign Office (released February 17, 1914), The Cat's Paw (March 17, 1914), A Debut In the Secret Service (April 7, 1914), and A Mohammedan Conspiracy (May 12, 1914). 2. The character of Abdul is also spelled as Abdool in various notices. Lajecz also appears as Lajec. Tamamoto also appears as the curious and incorrect "Tammamotoz." Yalo appears as Lato (two ways, even in the same Reel Life synopsis!). Farlesdale also appears as Farsdale. In some accounts Cat's Paw in the title is spelled as one word: Catspaw. "The Cat's Paw is the much-announced second adventure of the much-advertised Diplomatic Free Lance, whose magazine serial has been running for nearly a half-dozen years in the Blue Book - a magazine record! With James Cruze and Flo LaBadie. A peachy adventure that will 'draw' like wild-fire from magazine readers, of whom five million are estimated to have 'followed' the Clarence New serial." "Lord Farlesdale meets the Marquis Yato of Japan on board the flagship of the Japanese squadron, which is at anchor in the bay off Clovelly, where Lord Farlesdale has his country home. A secret treaty between the English and Japanese governments is turned over to Lord Farlesdale, who puts it in a safe in his home over night for safe keeping. 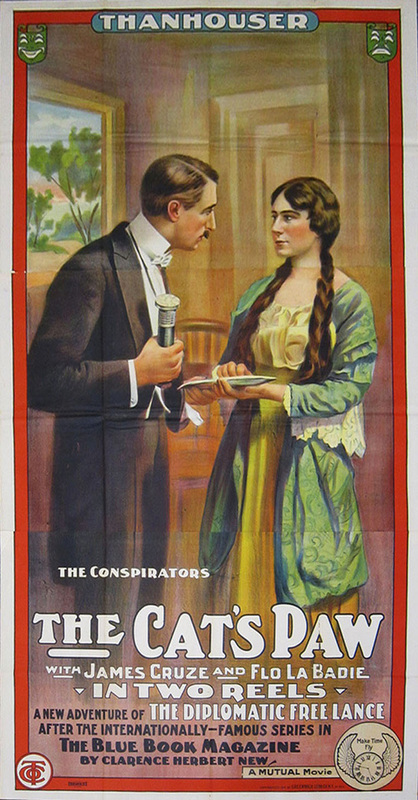 Pfaff and the Fraulein von Karenstauffen, a young noblewoman employed in the secret service of a Continental power, are determined to possess the treaty, and the beautiful young noblewoman almost succeeds in inducing Captain Mandeville, an English officer, to open the safe by telling him that the vault contains some compromising letters written by the Fraulein's indiscreet sister. Lord Trevor and his ward, Nan, who are also guests at a weekend party in the Farlesdale home, suspect Pfaff, the Austrian general, and his companion, and manage to frustrate their plans before Mandeville unwittingly betrays his country." "International politics, unscrupulous, clever, beautiful adventuresses, quick-witted, but young and unsophisticated girls, and, as if that were not enough, the country estate of an English nobleman as a locale, and you have a recipe that is sure to make an exciting melodrama, with a good chance for a love affair and a bit of filial devotion, not to speak of 'heart interest.' 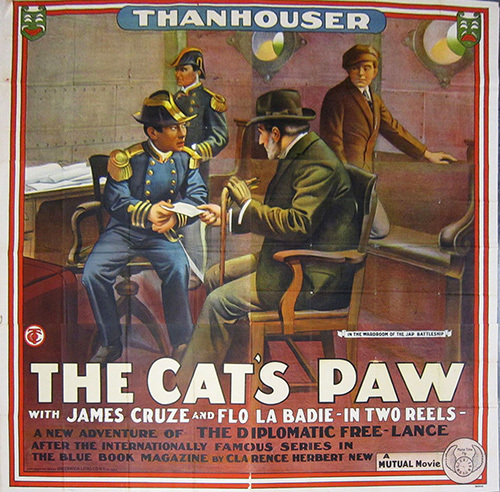 The Cat's Paw is a very excellent melodrama, and it is prepared 'according to Hoyle.' In the safe at the home of Lord Farlesdale are some papers pertinent to a new treaty with Japan. Pfaff and the Fraulein von Karenstauffen are in the employ of a Continental power (I wonder which one), and they are after said papers. They nearly get them, too; but Nan, the quick-witted but young and unsophisticated girl, foils them, with the aid of her guardian, Lord Trevor, and friends. Pfaff opens the red-sealed envelope (such envelopes are always red-sealed), and finds therein - a blank sheet of paper. (Curses). The film is well acted, Nan Bernard standing out conspicuously through her work as the adventuress, and the interior scenes of Lord Farlesdale's house show close attention to detail on the part of the director." "Another Clarence Hubert [sic] New story dealing with a free-lance diplomatist. It makes a very acceptable two-part offering. One finds it dramatically written, smoothly directed and intelligently acted - it shows competence all around. The staging and photography (leaving out one or two snow scenes) are as usual in this make of picture - that is, fine. It will interest and be a popular offering." "The second of the 'Diplomatic Free Lance' series, this, a two-reel offering of the melodramatic hue, though not intensely so, appears with all the interest of its predecessor. There are a good many nationalities represented in this picture, and there are at all times secrets of state at stake, and the only thing that might increase the hazard in the play is if the country concerned were our own instead of England. There is no doubt about it that the author has drawn into his scenario and the director has included in the scenes, some of the real natural atmosphere of the places and peoples it represents. The characters are those of the nobility and therefore carry that additional interest; on the other hand there are too many characters and they are not closely enough defined nor clarified to make them entirely understandable. Nor are some of the motives, some of the finer meanings of the play, sufficiently brought out. However, the general trend of the plot is easily understandable, and it is followed with interest and enjoyment. Lord Farlesdale meets the Japanese admiral and is given the papers of a secret treaty between Japan and England. He puts the papers in the safe in his house overnight for safekeeping. Pfaff, a German spy, and his fraulein, government spies, want to possess themselves with the papers, and the beautiful fraulein almost induces Captain Mandeville, an English officer, to open the safe, by telling him that the vault contains some compromising letters written by his sister. Lord Trevor and his ward Nan, who are also guests at the house of Lord Farsdale, suspect the two conspirators, and manage to frustrate the plans before the young captain betrays the secrets of his country." No Thanhouser release because of the two-reel film of the preceding Tuesday.